Review: These groovy microphones make a style statement, but do they back that up with performance? Whether you're podcasting, providing voiceovers or Skyping, the Neat Widget series of microphones performs – they have great sound as you'd expect from parent company Gibson, and they make a strong style statement to boot. Microphones are generally functional items that are chosen for their acoustic performance and functionality ahead of their design and style, and that's exactly how it should be. But why should looks go completely out the window when creating a mic? Why not add a soupçon of joie de vivre while recording that design podcast? Fortunately, world-renowned audio specialist Gibson has got out its soupçon spoon and dished out the outrageous Neat Widget trio of high-definition microphones. Each Widget is a USB plug-and-play hi-def mic, built around the same proprietary capsule and circuit design that delivers the same sonic quality, regardless of which design you choose. And there is one of the brightly-hued Widgets for everyone's taste, each imbued with its own character. 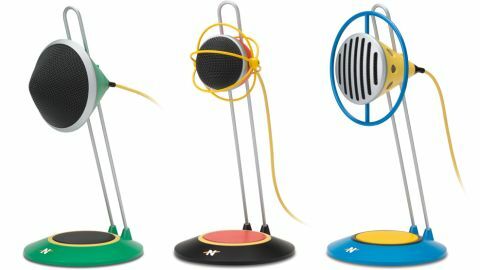 The Widget A has a retro-futuristic, 1960's-sci-fi look to it; Widget B has an atomic nucleus vibe and Widget C is a modern interpretation of classic radio mics. I tried out Widget C – the first thing you notice is how surprisingly large it is, as are its siblings. It takes up the desk space of a small-ish plate, so if your workspace is a little cramped you will have to consider this. However, once connected – a doddle on my Mac, and Gibson claims that the Widgets are similarly plug-and-play on Windows machines, too – you get the benefit of that large base with the mic's stability. It adjusts for height and reach also, so it's easy to get comfortable behind it. I couldn't help chuckle on more than one occasion at the Widget C's appearance (which may mean a bit of extra podcast editing to erase the sniggering); its cartoonish appearance genuinely brightens your desk. Okay, you're probably either going to love or hate the designs so let's dwell on that no longer. Fortunately, the Widgets are serious pieces of kit when it comes to sonics. I would say that the clarity is up there with professional mics more than double the price of the Widget trio. The microphones feature full-range 96kHz/24 bit audio, custom capsule, integrated internal pop filter and shockmount, and this combines to create crisp recordings and broadcasts that belie the Toys R Us aesthetic. The audio quality is certainly enough for bedroom recording and podcasting, and even near-pro level audio/video post production – Gibson reckons that you could record musical instruments too, although I did not try that out. Combine all this with each Widget's unique appearance, and there's no doubt that this is a top microphone for designers.